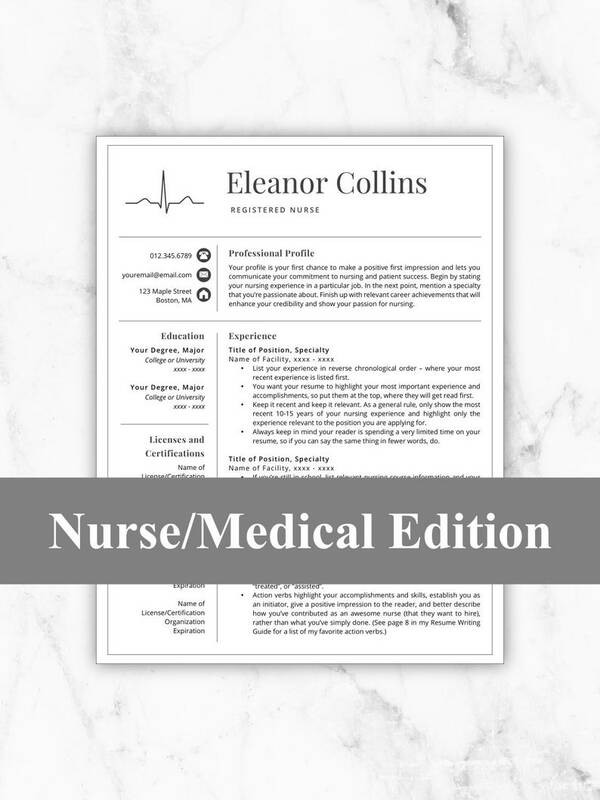 1 Page, 2 Page, and 3 Page Nurse Resume Template for Microsoft Word & Mac Pages: "Eleanor Collins"
Resume Sale!!! 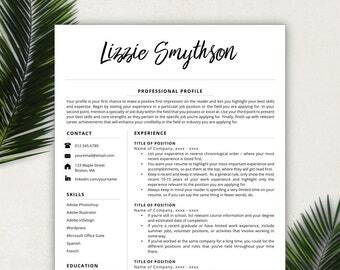 all resumes 50% off! •	200+ Icon Pack filled with social media icons, contact icons, professional icons, and more! A personal computer with Microsoft Word or Mac Pages. Templates are NOT compatible with any other program. You will need your own personal computer because all templates require a computer with the ability to download and install new fonts. The ability to unzip the .zip file the template files come in or an unzipping program to open the .zip file. 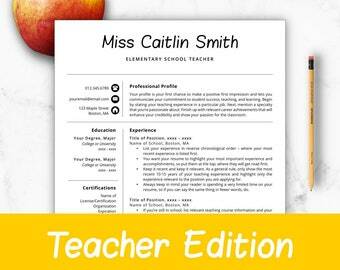 You MUST have a basic working knowledge of Microsoft Word or Mac Pages to be able to use and edit these templates. 2. Complete payment (credit, debit, and paypal accepted). 3. Download and unzip the files (after your payment has processed, Etsy will email you a link to your downloads and they will also be available in your Etsy account here: etsy.com/your/purchases). 4. Follow the included instructions in the Font Guide to download and install the required fonts. 5. Open the template in Microsoft Word or Mac Pages. 6. Delete and replace all dummy text with your own information. Change any colors and customize as you like. 7. 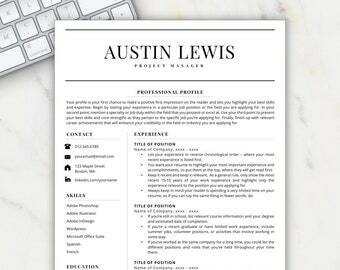 Save your new resume as a borderless .pdf file to email or print to potential employers. This listing is for digital (instant download) files only (no print pieces will be shipped to you). There are no returns or exchanges on downloadable digital file items. If you have any questions, please message me before purchasing. 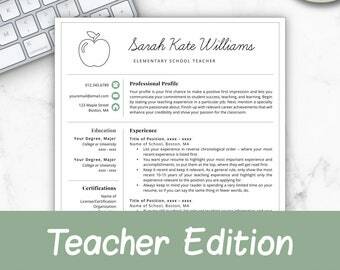 The Resume Template Studio is not responsible for any typographic, grammatical, production, or printing errors. Please don't forget to spellcheck and proofread your template - twice! three times! - before printing and emailing. **Please see my shop's policies sections for all payment, shipping, faq, and other important information of note. 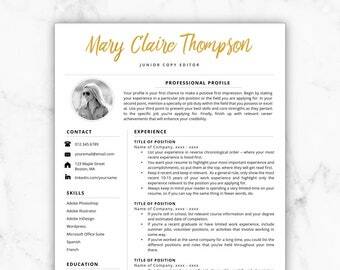 All designs © Resume Template Studio. All designs, templates, and content are for personal use only and are not to be sold, shared, distributed, duplicated, edited, or used, in whole or part, in any commercial or promotional purpose. Purchasing files does not transfer any copyrights. 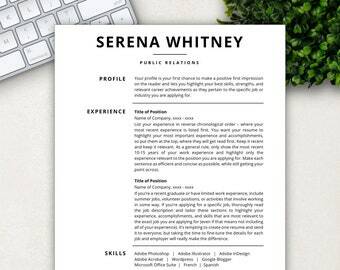 Resume Template Studio retains original copyright. Great template and amazing customer service. Highly recommend!! Simple and user friendly and it looks great! She went above and beyond to help me get this file to work on my computer!! Love the template too! File delivery: Files will be available to download once payment is confirmed. If you have any issues with your downloads or templates, please message me right away and we will work together to fix them or a refund will be issued. 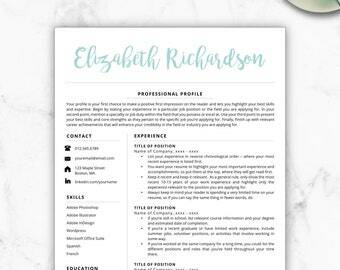 The Resume Template Studio is not responsible for any typographical, grammatical, production, or printing errors. 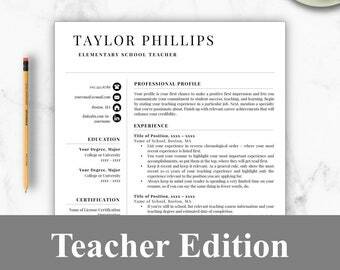 Please don't forget to spellcheck and proofread your templates before finalizing! 1. 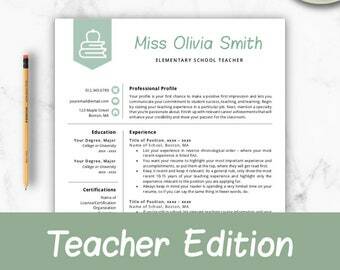 Purchase your favorite resume template. 2. Download and unzip the files (once payment is completed, digital files will be available in your Etsy account and also emailed to your Etsy registered email address). 3. Open the included "fonts" file and install the free fonts. 4. Open the template in Microsoft Word or Mac Pages, delete and replace all dummy text with your own information. Change any colors and customize as you like. 5. 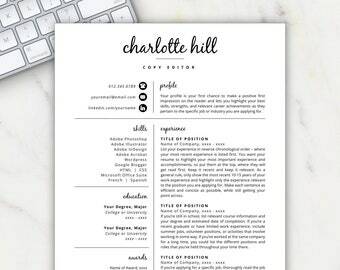 Save your new resume as a pdf to email or print. Good luck! What program do I need? 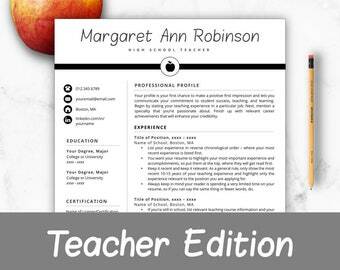 Mac Pages or Microsoft Word 2008 or newer (for Mac or Windows) is required to view and edit all resume templates. The templates do not work on any other programs. Will I be able to change colors/fonts/headers/etc.? Yes! 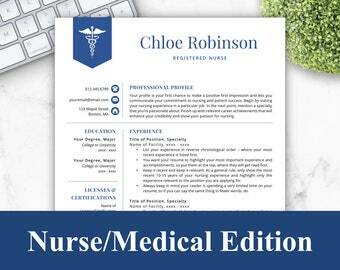 Everything on all of the resume templates is fully customizable and editable, except for the icons. (The icons are images and cannot be recolored; however, if there's a circle behind the the icon it can be changed it an color). You can easily change the fonts, colors, and headings as you normally would in any Microsoft Word or Mac Pages document. You can change things and move sections as much as you choose. Or you can leave them as is...it's totally up to you. I will walk you through how to make these changes in the included Instruction Guide. 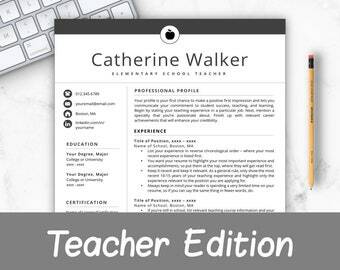 To access your digital file(s), go to You > Purchases and reviews and look for your order from the Resume Template Studio. To the right of the order, click Download Files. This goes to the Downloads page for all the files attached to your order. Will my instant download files from Etsy expire? Nope! As long as you have an account with Etsy, the files will remain in your Downloads folder. Drag the file to the folder you want it in, then double click the .zip file to open it. 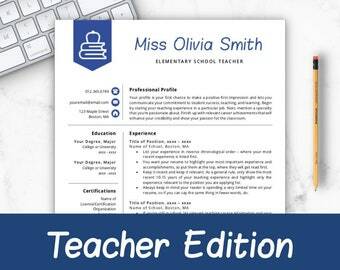 Got the fonts on your computer, but still having trouble with the templates? Try restarting your computer or at the very least, opening and closing Microsoft Word (it gives your computer a chance to add your newly downloaded fonts :). 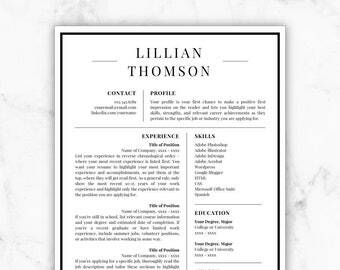 I have finished my resume templates and want them to be one file, instead of emailing someone three or four different files. How can I do that?